The demand for (and cost of) Seattle housing has grown by leaps and bounds in the past few years, and everyone is feeling the crunch. If you’re a technology professional, you may be searching for better housing solutions: better value for your money, more space, or even just some peace and quiet. The good news is, you have options: there’s a more affordable market for you to discover, and it’s just a comfortable commute across the water. Whether you’re hoping to grow your family or you’re looking for easy access to all the amenities Western Washington has to offer, Bremerton might be the perfect location for you. Here are five great reasons you should consider a home on the Kitsap Peninsula. Bremerton houses offer more space. If you’re an apartment dweller, you already know how tricky it can be to add a four-legged friend to your mix, let alone make space for a growing family. Seattle presents significant challenges when it comes to room to run and in-home space, but you’ll find that the houses on the Peninsula offer a variety of options to suit your individual need for space. From large back yards to homes on acreage to easy access to the great outdoors, Bremerton (and the surrounding area) has it all. Bremerton puts you close to amazing outdoor opportunities. Craving fresh air and physical exertion after putting in long hours in front of a screen? Bremerton offers the perfect home base for adventure. Hiking, swimming, boating, and camping are just a short drive away, and give you all the extra play room you might want for a weekend or a day trip. Bremerton offers geek-friendly downtown areas. If you’re on the geeky side, you’ll be welcomed in downtown Bremerton. Drop some coins at the Quarters Arcade [LINK], share a pint with friends at our very own gaming pub Ashley’s Pub, or fully immerse yourself in your game of choice at The Game Wizard and Blue Sky Hobbies -- all within a short walk from the ferry. Our geek havens thrive side-by-side with all the other bars, eateries, and shops popping up in the downtown area. You don’t have to be in Seattle to find an outlet for techie fun! Seattle housing prices have skyrocketed in recent years, with the median house price now coming in at over three quarters of a million dollars! You can buy a house in Bremerton for a fraction of the cost. You’ll get the most for your money by choosing a community that still has room to grow, and be able to save more funds for your future (or enjoying your life today). Most affordable places outside the city put a messy, stressful drive between you and your home -- but not Bremerton! Washington State Ferries, which make up a part of our state’s highway system, make for an easy commute around the Puget Sound. To make the daily trek easier, Kitsap Transit recently added a new fast ferry that takes only 28 minutes to get between Bremerton and downtown Seattle. The last thing you want after a day at the office is more time spent on an uncomfortable commute; why not relax, work, socialize, or enjoy a craft beer on your way home instead? Bremerton offers a host of appealing qualities. The space, pricing, and convenient location can’t be beat. Whatever the details of your current situation, the Kitsap Peninsula gives you an opportunity to create a home without leaving the city behind. 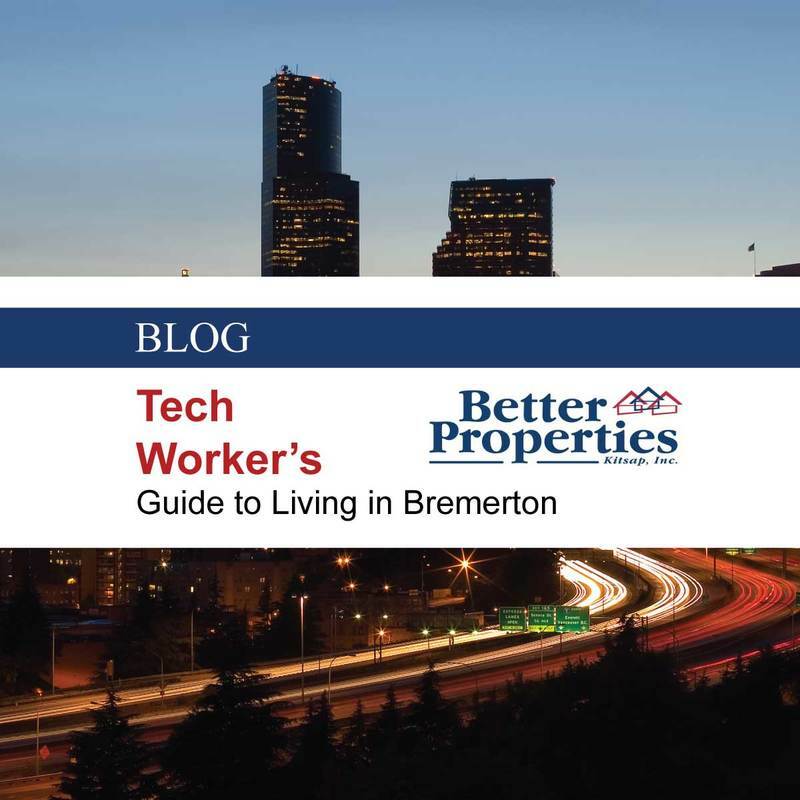 If you’re ready to consider what living in Bremerton could do for you, you can brush up on what you need to do to get your finances in order -- and make your dream of homeownership a reality! We just launched our free home tours! Join us on Saturday 9/16 or Saturday 10/14 for a tour around the available homes in Bremerton. If you’re interested, sign up on our Eventbrite page. Attendees will also receive a goodie bag filled with treats from the Kitsap peninsula. Sign up today by clicking on your preferred date above! give us a call at 360-479-6700 - We´re happy to answer all your questions.